Three Australians are on the list to compete in the 2018 Rotax MAX Challenge Euro Trophy. 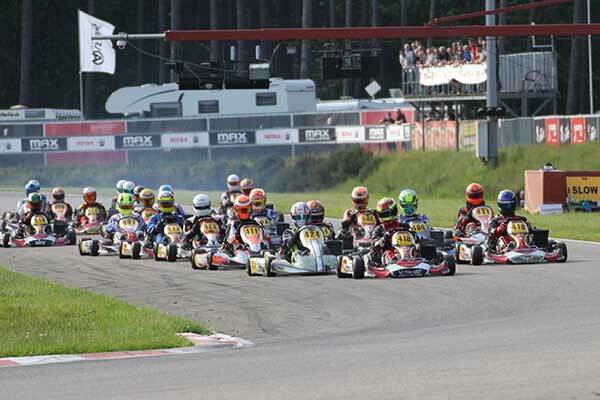 Commencing at Genk in Belgium this weekend, Christian Mansell (OTK #308) and James Wharton (FA Kart #313) and are part of a 49-kart Junior MAX field. Jaiden Pope (Exprit #302) is on the series list, but not for round 1. Over 120 drivers from 20 Nations will compete across four classes. The brand new Rotax MAX Challenge Euro Trophy is ready to go. MAX Euro Challenge, which has been discontinued by the end of 2017. The Rotax MAX Challenge Euro Trophy will comprise four rounds in 2018: Genk (Belgium), Kristianstad (Sweden), Bruck (Austria) and Wackersdorf (Germany) are the venues of this year’s tour. Only established top karting circuits have been selected for the debut season, offering the most modern and professional standards to the elite drivers of the Rotax racing community. Equally the 3-day-format and limited number of tyre sets will keep costs in line. An experienced crew, gathered around organiser Meik Wagner from Camp Company GmbH, will guarantee smooth running of the events which will feature live streaming and live timing of course. The new concept obviously hits the market’s demand: Over 120 drivers entered the Rotax MAX Challenge Euro Trophy in the categories of junior, senior, DD2 and DD2 Masters, representing over 20 nations from all over the world. Each of them does not only head for the European crown but for a place in the Rotax MAX Challenge Grand Finals in Brazil. A total of nine tickets will be awarded at the end of the year for the big showdown of the world’s best Rotax drivers. The premiere of the Rotax MAX Euro trophy will take place from April 20th to 22nd in Genk, the socalled “Home of Champions”. The international track in Belgium is popular with the drivers and offers a variety of corners and straights on its 1.360 metres long lap, which has been the setting of many thrilling and unpredictable races. The outcome of the upcoming competition is even more difficult to foresee, if one has a look at the entry lists: Several newcomers and youngsters will clash with experienced old stager and well-known Rotax faces. Yet the are some favourites worth to be mentioned: Multiple World Champion Cristiano Morgado from South Africa belongs to the most successful karting drivers: In 2018 the Rotax icon is ready to attack in the DD2 Masters category. Austria’s Constantin Schoell (Daems Racing) must be mentioned as favourite for the DD2 class, since he won the European crown in 2017. That applies to Jordan Brown-Nutley (Dan Holland Racing). The Brit took the European title of the senior class in 2017 and aims to defend it in the Euro Trophy 2018. But these names mark only the tip of the iceberg: All told the Rotax MAX Euro Trophy promises a highly balanced level of competition and most thrilling race action in each category. Let’s see who will set the pace at the kick-off in Genk.